How do gut bugs affect brain health? Our brain lives in a symbiotic relationship with the bugs in our gut. Whatever we eat, they eat. In return, they help our brain function optimally in a variety of ways. During the past few years, it has become increasingly apparent that in the absence of bacteria humans would never have evolved to our current level of cognitive performance. Our brains are profoundly dependent upon a wide range of chemicals produced by these gut bugs. For example, without these gut microbes our brains don’t correctly develop the serotonin neurons that play a key role in the control of emotion. For every one of your big human cells, roughly 100 to 1000 little bugs live alongside and inside of you. If you were to count all of the cells on and inside of you that are not actually you, they would number in the hundreds of trillions, with approximately one million of these microbes living within every square centimeter of your skin. These bugs were not simply along for the ride as we became the dominant species on this planet; they made the journey possible. As soon as individual cells evolved into fully multicellular organisms during the Cambrian period about 500 million years ago these bacteria and viruses quickly discovered the fantastic survival benefits of fully integrating themselves. Once there, they never left. The total weight of the many trillions of bugs that reside in your gut is over two pounds and they are multiplying constantly thanks to all of the food you are providing them. They are also in a constant battle for survival. The viruses in your gut kill so many bacteria every minute that their carcasses account for about 60% of the dry mass of your feces (now you know what is in there). 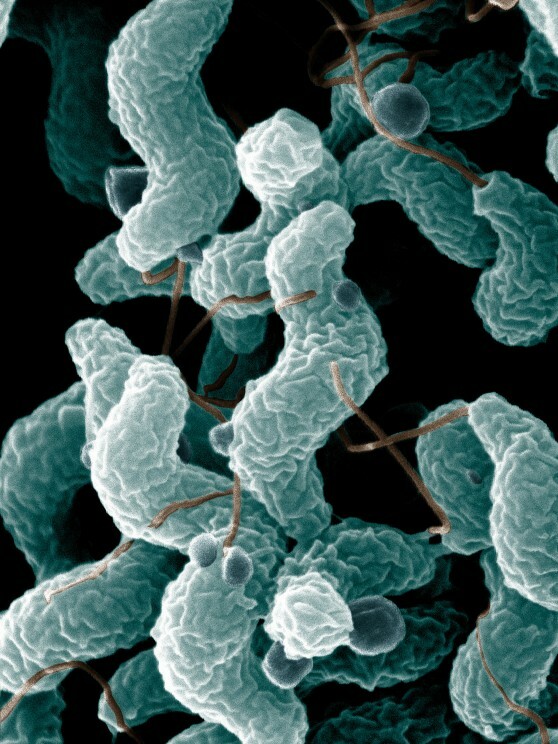 ARS Campylobacter jejuni. 22 October 2007. Agricultural Research Service via Public Domain via Wikimedia. 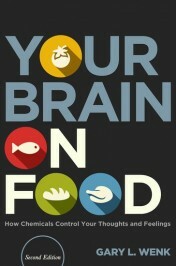 Gut bacteria produce many different chemicals that can influence brain function. They convert the complex carbohydrates in our diet to the fatty acids butyrate, acetate, and propionate. Butyrate can easily leave the gut and enter the brain, where it can influence the levels of the brain-derived neurotrophic factor (BDNF). BDNF plays a critical role in the birth and survival of neurons and the ability of the brain to learn and remember. Reduced levels of BDNF are correlated with impaired cognitive function and depression. Gut bacteria also produce the neurotransmitters norepinephrine, dopamine, acetylcholine, and GABA. Although these molecules cannot cross the blood brain barrier, they indirectly affect brain function via their actions at the vagus nerve. The presence of the bacterium Bifidobacerium infantis 35624 has an antidepressant effect in animal models of depression due to its ability to release tryptophan, a precursor to the production of serotonin. Accumulating evidence suggests that gut bugs play key roles in both the developing and mature nervous system, and may contribute to emotional and behavioral disorders as well as numerous neurodegenerative diseases. We need to take good care of these bugs so that they will take good care of our brains. Consuming prebiotics and probiotics can help us to maintain a healthy diversity within the bug environment. For example, elderly and frail humans who have major cognitive impairments also have the lowest level of bug diversity in their guts. Can we manipulate their world in order to improve our health? Yes. Diabetes and the metabolic syndrome are well-known risk factors for developing dementia. A recent study discovered that consumption of Lactobacillus acidophilus and nutritional supplements combining probiotics and prebiotics for six weeks had significant positive effects on the level of serum insulin, C-reactive protein, and uric acid. Humans fed a mixture of probiotics containing Lactobacillus helveticus R0052 and Bifidobacterium longum R0175 for thirty days had reduced production of the stress hormone cortisol. Clearly, the bugs in your gut can positively or negatively influence your mental function and stress response. It is definitely worth your effort to keep them very happy with a healthy diet. However, what happens when we attack them with antibiotics? There is now good evidence that antibiotic treatments may have long term negative effects upon mood. If someone has a genetic predisposition to a mood disorder, such as major depression or bipolar disorder, the risk is much higher. The challenge becomes how to balance intelligently the risk to the gut biome and brain against the risk of not taking an antibiotic. Well that must be where the expression “you are what you eat” comes from. It seems even more logical now !